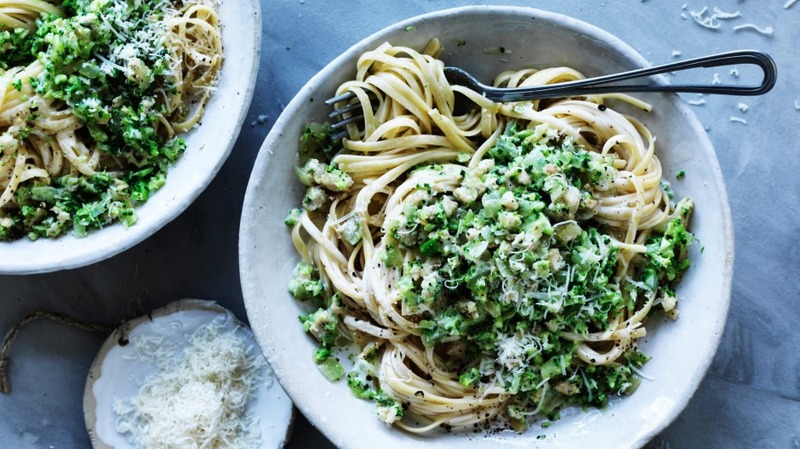 Finely chopping the broccoli and chicken allows them to be incorporated with the pasta, rather than leaving big chunks that spoil the overall texture of the dish. 1. Bring a large pot of water to the boil to cook the broccoli and pasta. First, boil the broccoli for one minute and remove to a cutting board, reserving the water for the pasta. Finely chop the broccoli. With a knife, coarsely mince the chicken. Boil the pasta according to the packet instructions. 2. While the pasta is cooking, heat a very large frying pan over medium heat and add the oil. Fry the chicken until lightly browned, then add the onion and garlic, continuing to fry until they are softened. Add the chopped broccoli and fry for a further three to five minutes. Add the cream and stir well. 3. When the pasta is al dente, drain the pasta and reserve about ¼ cup of the pasta water. Add the pasta and reserved pasta water to the chicken and broccoli over heat and mix well. Season to taste and serve with parmesan cheese. If you like creamy pasta, try Neil Perry's garganelli with peas and prosciutto.